La Librería is among my favourite bookstores in Vienna and it’s one of those places I keep bouncing back to, both for my philology studies and beyond. Its interior is curated with lots of heart. Just take a look at their shelf selection and you’ll know what I mean. Throughout the years I’ve been getting reading material here I’ve enjoyed several cheerful conversations with the lovely shop co-owners, an Andalusian lady and her Austrian husband, both very well-read and happy to be of help by guiding you to a worthy new acquisition. 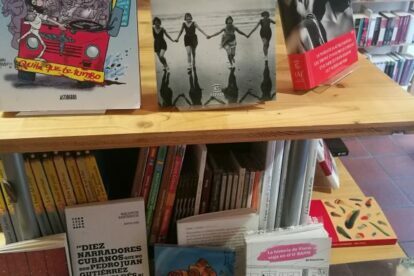 Not only does La Librería sell classics, current novelties and even children’s books in Spanish, they also have a fine selection of Portuguese literature and dictionaries. This is one place any literatura-enthusiast in Vienna will come across quite obligatorily, also because the shop owners know most of the university professors and which literature they have picked out for the semester – it’s an institution, you see, so take advantage of it: here they also know exactly which book is compatible with which level of language skill. To be honest, I’ve been meaning to write about this place for ages. So put it in the (not linearly translated) words of the shop owner: Nunca es tarde si la dicha es buena – it’s never too late to set things right.